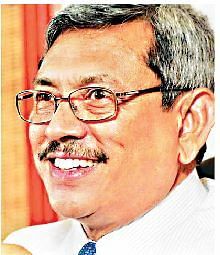 COLOMBO: Sri Lanka’s once powerful Defence Secretary, Gotabaya Rajapaksa, wants President Maithripala Sirisena and former President Mahinda Rajapaksa to join hands to give the island nation a “functioning government” and lift it from the abyss of political confusion and economic stagnation. “Maithripala Sirisena has been elected President for six years. Therefore, he will have to continue. But he can quickly call for parliamentary elections and appoint Mahinda Rajapaksa as Prime Minister. Together, they should put the country back on its feet by providing a functioning government with people committed to achieving goals,” Gotabaya told Express in an exclusive interview on Tuesday. “On the one hand there is Prime Minister Ranil Wickremesinghe who is running the government. But on the other hand, Chandrika Kumaratunga, Champika Ranawaka and Rajitha Senaratne also claim to be in-charge. However, what is clear to the people is that there is no functioning government. All economic development projects initiated by the Rajapaksa government have been brought to a standstil. In the construction sector alone, over 100,000 workers have been rendered jobless by the stoppage of projects,” he pointed out. Because officials are being hauled up before investigative agencies for alleged “procedural lapses”, no civil servant wants to take decisions. “If this situation is allowed to continue, the entire economy will collapse and it will be difficult to put it back on its feet,” he warned. Gotabaya, who has been asked to appear before the Bribery Commission later this month, dismissed the charges against him as being baseless. “I have been accused of procedural lapses. Have I robbed money? In fact, I have earned money, including foreign exchange, for the government through my projects,” he asserted. On the alleged illegal activities of the “floating armory” set up by a company wholly owned by the Ministry of Defence, Gotabaya said that it was engaged in anti-piracy work in the Somalian waters as per a UN request. “It was an international obligation Lanka had to fulfil. And the company was earning foreign exchange for the country. It had also been held up as a model by an international maritime security body based in UK,” he said. The former Secretary for Defence and Urban Development said that he had not only won the war against the Tamil Tigers but had given a new face to Colombo, both not done by previous regimes. “The present government is after me for delivering results. Sarath Fonseka claimed in India that he won the war. But I say, he was in the army for 30 years, but had failed to win the war. It was only when we (the Rajapaksa brothers) took over, that the war was finished, and that too, in three years flat. Chandrika Kumaratunga claims that she had won 75 per cent of the war, but it was during her Presidency that there were major reverses,” Gotabaya recalled. The Lankan government on Tuesday gave into the Opposition’s agitation demanding that ex-President Mahinda Rajapaksa should not be summoned by the Bribery Commission. Wijedasa Rajapaksa, minister for justice, told parliament that a commission officer will visit Rajapaksa’s house and take a statement from him instead. The Opposition’s position is that Rajapaksa could not be taken to court or be questioned for an action he took as President as the President enjoys immunity for his official acts. Rajapaksa had appointed a defector from the Opposition as a cabinet minister during the last Presidential poll campaign. This was deemed as corruption.